Mumbai AC train's Base fare of the single journey of AC EMU (Suburban Train) will be 1.3 times of the base fare of existing fare of single journey ticket for first class. 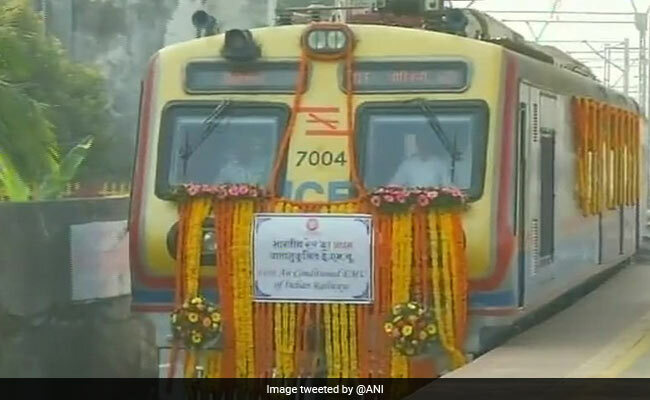 Indian Railways has introduced the much-awaited AC local train service in Mumbai. The air-conditioned coaches of the new Mumbai local started its run from Churchgate to Borivali in December. From January 1, the Railways will start operation from Churchgate to Virar. The new Mumbai AC local trains will run on the Borivali-Churchgate section of the Mumbai suburban line under Western Railway, which caters to one of the zones under Indian Railways. Equipped with new features, the train is aimed at ensuring a safer and more comfortable journey for passengers, an official release said. From January 1, it will run from Churchgate to Virar having 12 services per day, news agency Press Trust of India cited WR chief spokesperson Ravinder Bhakar as saying. Base fare of the single journey of AC EMU (Suburban Train) shall be 1.3 times of the base fare of existing fare of single journey ticket for first class. However as an introductory offer for a period of initial six months, the base fare of single journey of AC EMU shall be charged 1.2 times of the base fare of existing fare of single journey ticket of first class. The difference between 1.3 times and 1.2 times will be shown in the ticket as discount during the introductory period, according to the press release dated December 24. Season tickets: Weekly, fortnightly and monthly season tickets shall be charged equivalent to 5, 7.5 and 10 single journey of AC EMU respectively. No other type of season tickets shall be issued for the time being. The new train service will operate with a fully air conditioned rake with a capacity of 30 tonnes per coach. The new Mumbai AC local will have a passenger carrying capacity of 1,028 seats a total of 5,964 passengers. The new Mumbai AC local will operate with stainless steel coaches having straight side walls. The train will operate at a maximum speed of 100 kilometres per hour. The coaches will come equipped with automatic door closure systems, LED-based lighting, LED-based coach identification systems (for alarm chain pulling and door malfunctioning) and emergency talk-back systems. The train will not start or take traction if any of the doors is open. The Mumbai AC local has been provided with modular polycarbonate seats, aimed at the comfort of passengers, and wide double-sealed glass windows for panoramic view, among other features. The rakes are also fitted with GPS-based passenger information systems, equipped to provide features such as passenger announcement, communication (between the driver and guard) and coach displays, among other features. The AC train services will not run on Saturdays & Sundays for maintenance purpose, the railway ministry said.